And finally, the long wait is over. 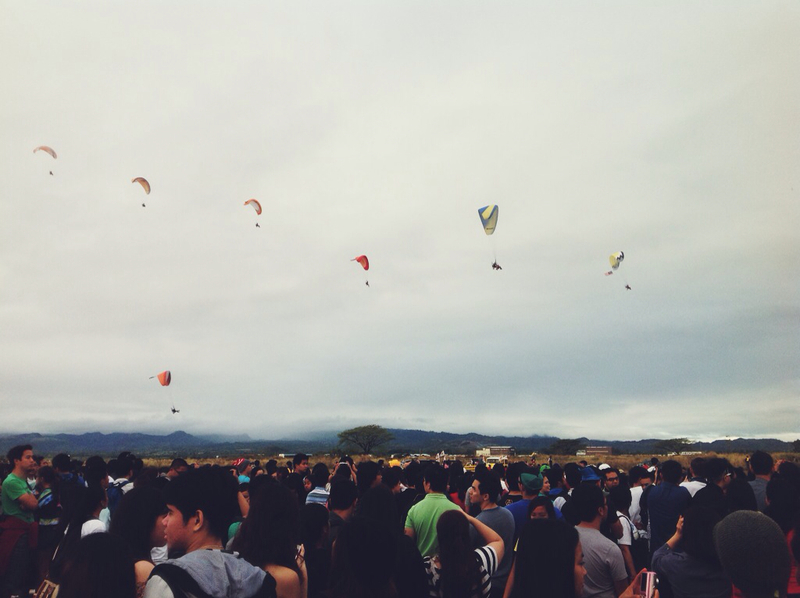 Watching gigantic balloons, parachutes, and European fighter jets flying above us was an experience worth remembering. Surreal, amazing, and exciting. True enough, FLYING is more fun in the Philippines! My classmates and I had already planned for this event weeks before. The event was just one of our ways to treat ourselves as we proceed to the next facility (from Approach to Enroute). The 18th Philippine International Hot Air Balloon Fiesta's venue was at Omni Aviation Complex, Clark Freeport Zone, Pampanga. 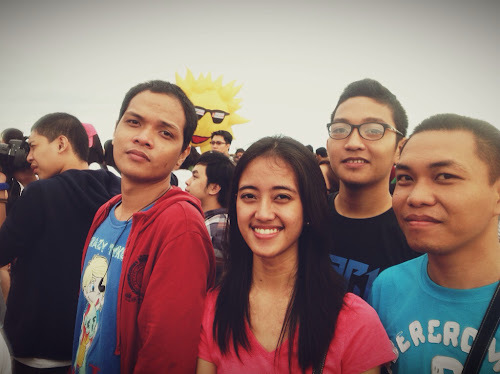 For only Php 250, one can have an all day access to all events. Good morning from Clark, Pampanga!!! 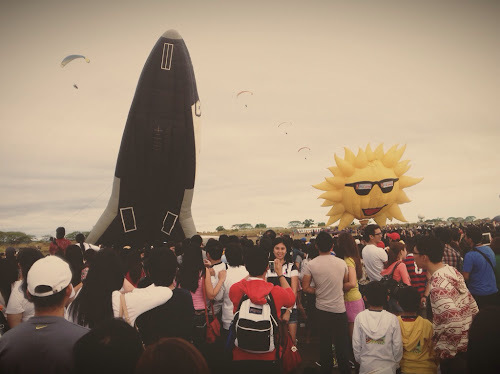 Space Shuttle and Mr. Sun! The crowd was crazy but the long wait was worth it! We left Manila at around 4:30 AM (thank God we managed to wake up despite having less than three hours of sleep). We arrived at Dau, Pampanga at exactly six in the morning. After two jeepney rides, we stopped by at a checkpoint and started our death march (pun intended). The crowd was bigger than I expected and I began to worry. The crowd got even bigger as we approached the ticket booth. Thank God, the processes were efficient and we entered the complex without hassle! The sun was already up but the wind was still cold. The balloons then started to fly. It felt like I was watching a movie or what... pardon for that lousy comparison but that was exactly what I felt during that time. But wait, there's more! One of the highlights of the event was the Aerobatic show of the Breitling jets. No wonder why this annual event drew millions of people to Omni Aviation Complex. 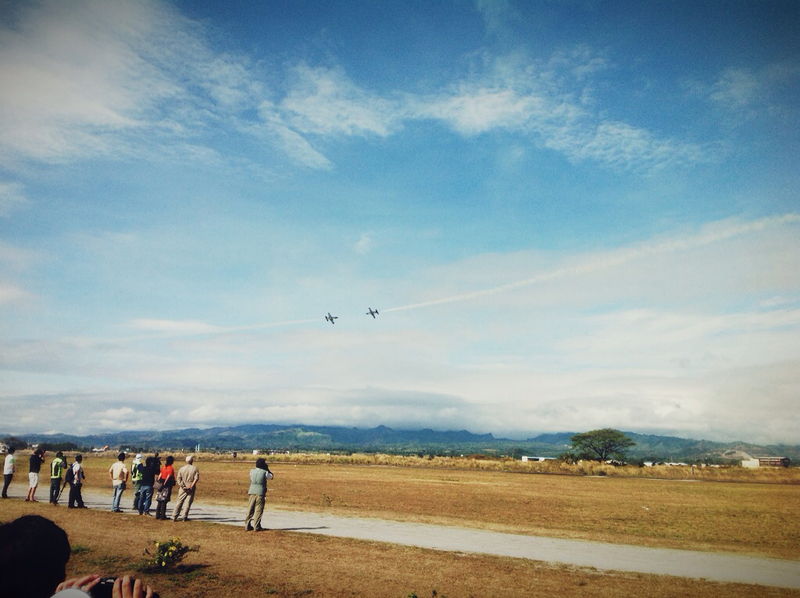 The aerobatic flights were performed by some Filipino pilots and as well as foreigner pilots, mostly coming from Europe. As the temperature got higher, the atmosphere became more tense as we patiently waited for the Breitlng French Jets. These two planes are about to collide... not! Then all of the sudden, we heard a sharp and piercing sound coming from one direction. The seven Breitling jets flew in one group (formation flight) and performed deathdefying maneuvers. And yes, I ain't exaggerating here folks! I really thought that the two jet planes would collide each other. Everyone was all like, "Aaaaaahhhhhhh!" all the time. Kung nangyari pa yan sa Aerodrome simulation, siguradong wash-out na to! It was breathtaking! I never thought that it would be THAT amazing! The show lasted for like 45 minutes, more or less, and it had a grand ending, bee tee double u. But the fun did not stop there! We toured around the campus of Alpha Aviation Group flying school in Clark (thanks for the yummy treats!). Two of my classmates even won diecast models of A320 and B737-800. And the best part of the tour? We went inside the state-of-the-art A320 simulator!!! Awesome sauce! I really wanted to become a pilot when I was young but I need millions in order to finish flying school. But then again, I am still happy with what I am doing right now. At least, it is still in the field of aviation. My weekend was fun and exciting. The event reminded me that somehow, I am slowly reaching my dream. I can almost feel and taste it. I would definitely go back to Clark next year and relive the surreal experience. Bring umbrella, sun screen and other stuff that would protect your skin from the harmful rays of the sun. Mind you, Clark's heat is unbearable. Correction... will always be unbearable. Be there as early as you can. Para sulit din ang Php 250 niyo! Be with your family or friends! It is more fun to be with your loved ones than to be alone. Teehee! The hot air balloon ride costs 250 per head... as in 250 US Dollars. Hahaha! Oonga no? 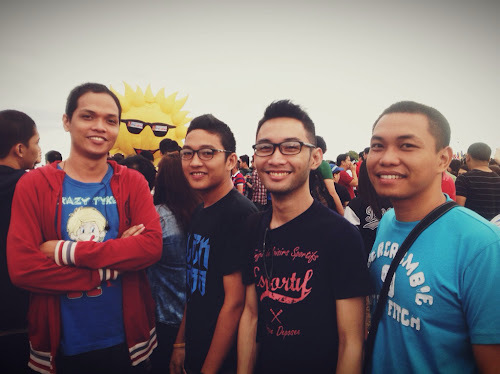 The last time we met was during Wordcamp 2012 pa! HAHAHA! For someone who's really fascinated with aviation, I'm sure it was epic for you. 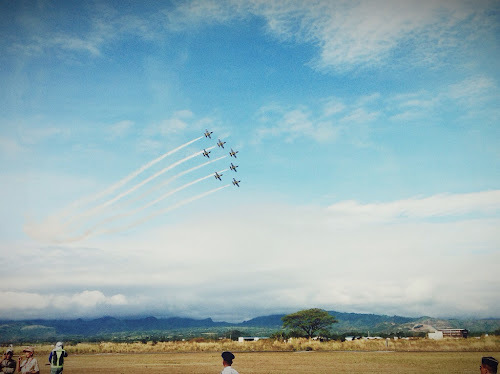 I feel such a loser seeing the Breitling Jet Team at the PIHABF Press Con but not witnessing their stunts on the event day. I hope they perform again next year. Nice post, I am sure that maam Lou is so proud having a son like you. God bless. 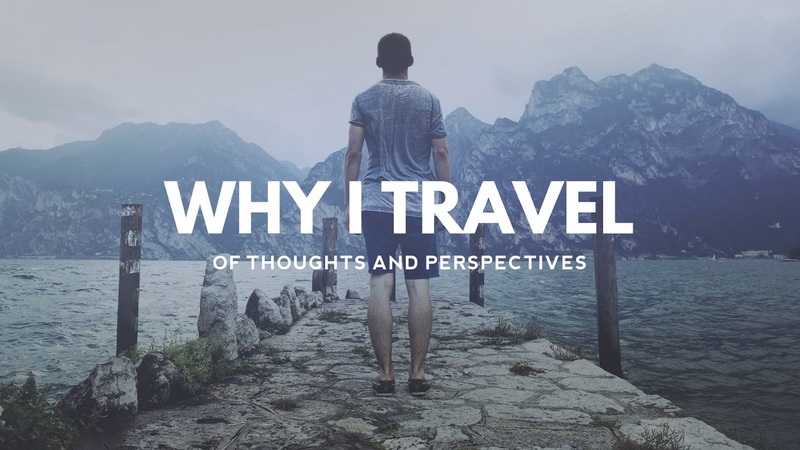 found your blog by searching about malapascua and bantayan island ang read some more interesting stories. definitely having a hard time choosing between bantayan and malapascua any advice? I love this post very much because it's really interesting with attractive photographs. I love to enjoy such adventure shows. looks like you had fun. well-written article. i missed this, as well as the press con. was hoping to catch the Breitling Jet. Great photographs. I wish I could have join with you !